Ecological Sanitation or ecosan is a safe, environmentally and economically sustainable approach to sanitation. It is especially relevant in the world today because it does not waste or pollute water. It is economically attractive because it provides organic fertiliser and humus for nourishing poor soils. 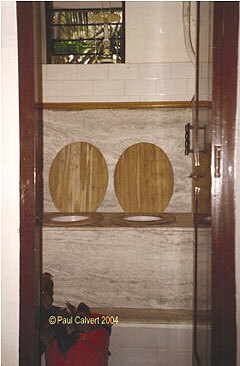 And don’t curl up your nose in horror, these eco-toilets do not smell and can be as modern and up-market as you like! eco-solutions has produced a book and poster set full of colour pictures and straightforward messages that hit home the ecological disaster of major sewage schemes and flush toilets in high-water table areas. The illustrations show clearly How ecological sanitation offers safe and attractive alternatives for rural and urban dwellers. No matter whether you live in a simple shanty or village home or in a fancy city apartment there are ecological sanitation solutions for you! 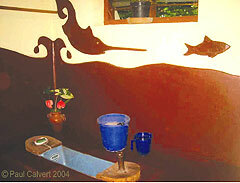 Calvert has an eco-toilet in his office and apartment in Trivandrum. This book and poster set are tools that government and ngos alike would find invaluable in raising awareness and debate on ecological sanitation. In the recent storm surges after the December tsunami several villages in southern Kerala were flooded. Some of these villages were ones where Calvert and his teams have built eco-toilets. Conventional toilets overflowed and the contents of their pits floated around the village disgusting everyone with the sight and smell – and posing a serious health hazard. In stark contrast all the eco-toilets were unaffected and consequently there has been a surge in demand for them with people claiming that ‘this is the only suitable toilet for our villages’. There is no doubt that ecosan toilets offer a good solution to sanitation challenges in high water table areas in coastal settlements as well as in water-scarce or rocky areas. Since construction of the eco-toilets requires a fair degree of skill and training eco-solutions has developed a new type of toilet of pan - the ecopan - that simplifies the construction of the toilet. There are examples of these operating in urban and rural environments for a number of years now to the full satisfaction of the users. 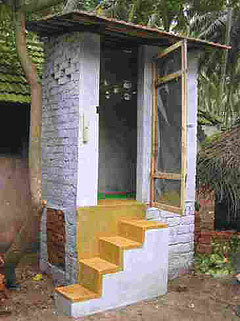 The Original ecopan from eco-solutions – makes eco-toilets easy to build and makes owners proud of their toilet. 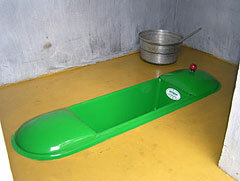 An EcoToilet by eco-solutions, Attractive and Appropriate sanitation. Funded entirely by the user who also made the roof and door by themselves. “We want this type of toilet because water-closets overflow and stink when the place floods”. Peri-urban settlement, Kerala. (see www.eco-solutions.org) in small numbers in earlier years for its own projects and development work. The workshop was hit by the tsunami and moulds and pans were damaged. But now a new unit has been established with girls from tsunami-hit areas. To help develop awareness of ecosan, competent constructors and successful ecosan projects eco-solutions offers Ecosan Orientation days and training courses for NGOs, Governments as well as hands-on skills training for construction workers.